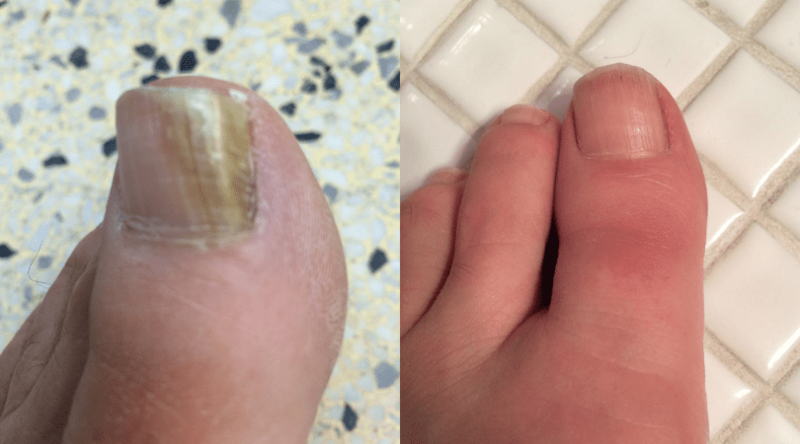 Thick, yellow, ugly toenails; Fungal nails. Find out how to treat them and tips on keeping it from coming back. "I have thick yellow ugly toenails!" Ah, this sounds like you might have Onychomycosis, which is just a fancy term for fungus in your toenails! Fungus lives everywhere and is most often found in warm, moist places like a shower or swimming pool. Again, I can’t say this often enough to people: “Don’t walk barefoot especially in public places!”. Walking barefoot in public places is like playing the lottery but this is one lottery you definitely don’t want to win! Fungus is very common, it loves mostly in moist, warm and dark places. It often finds its way into a toenail after an injury of some kind: bumping your toe, dropping something on your toe, cutting the nail too short. Once the fungus gets in there it starts multiplying like bunnies! Your nail starts to get thicker, yellowy, brownish, maybe even black spots, hard and crumbly. This makes it look ugly and you don’t want to show your toes in public anymore. Topicals: most topicals are available with very little side-effects but also have a low success rate. You have to apply the treatment religiously every day for at least 1 year and even then the success rate can vary between 1- to 25%. Oral: the oral treatment is a pill you take every day for 3-4 months. It has a success rate of around 65% but there can be serious side-effects. The most common one used today can cause side-effects with your liver. Who wants to damage their liver for the sake of ugly toenails? Laser: lasers are a technology that has been available for a few years now. It is safe to use and has almost no side-effects. It has a higher success rate when combined with a topical treatment. No matter which treatment you choose, it is important to know that nothing is foolproof. Depending on how bad your fungal infection is, and how long its been there, your chances of getting rid of it will vary. At Bruyere Foot Specialists, the Chiropodist will be very honest in letting you know if you can get rid of it, or if you may have to live with it. You will also be given homework to do and the more you follow the instructions the better chance you have of success.